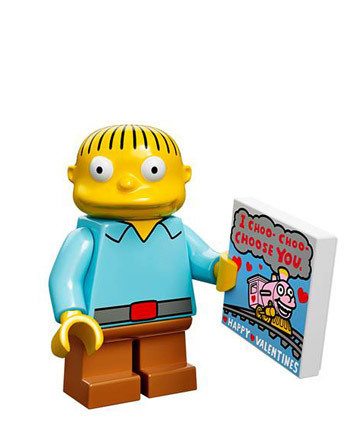 Lego is on a roll with their Collectable Minifigures. 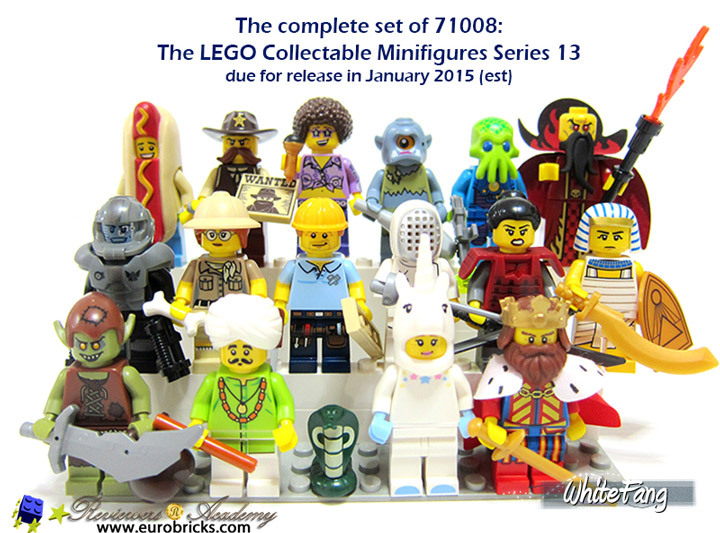 The newest Lego Collectable Minifigures Series 13 (71008) has a release date of January 2015. Which means you can probably expect a few retailers to sell them at the end of December. So, make sure to save up your Christmas money because there are a lot of great figures. 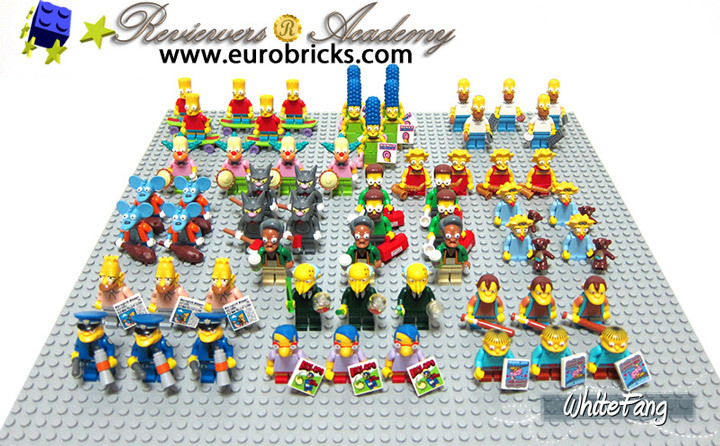 Series 13 continues the trend of extremely detailed Minifigs, while increasing the quality. These figures are still made in China but a lot of the production problems of the past have been worked out (slightly off colors, tight or loose connections, etc.). Interestingly, there is also some sort of code/contest thing going on with each figure. The only bad news is that these are at the, now permanent, price point of $3.99. Although some retailers (notably Target) may be selling them at $2.99. 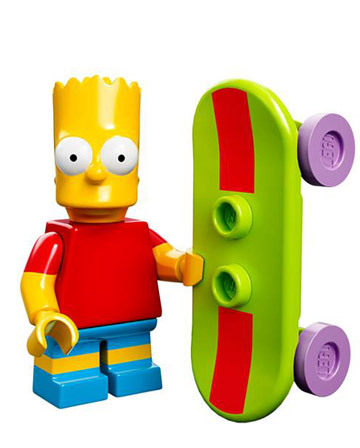 Lego has made a few breakthroughs in Lego Minifigures during the Collectable Minifig theme. This time around there seems to be a breakthrough in cloth capes. Featuring multi-piece capes with color printing! Whoa! 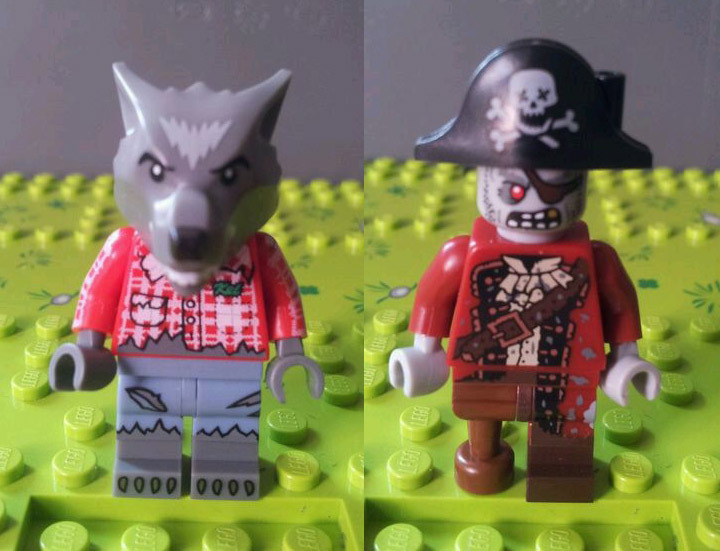 As has been the case for the past few years Lego reviewer WhiteFang has received a full set of Collectible Minifigures early. 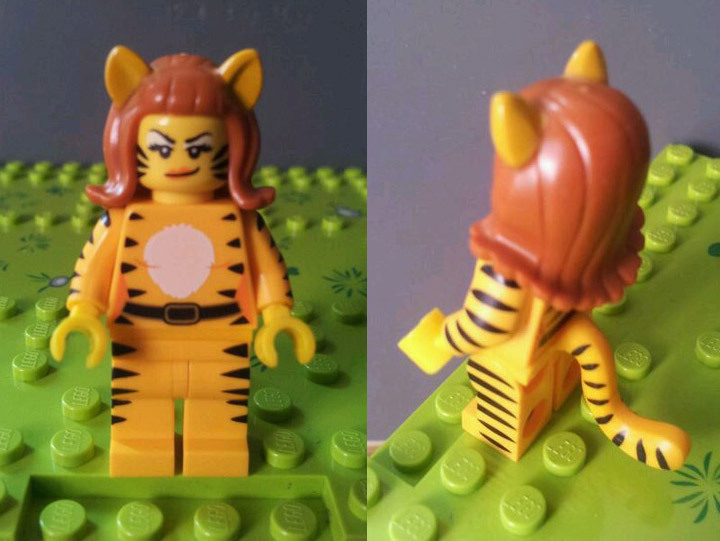 This allows WhiteFang to be the definitive source for Minifigure reviews. 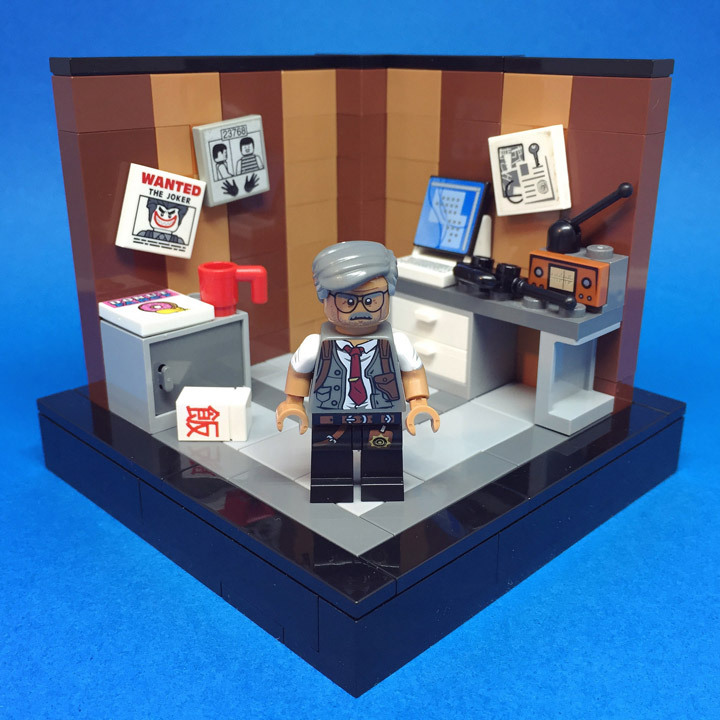 Check out the full Series 13 review over on Eurobricks, it features part analysis, detailed photos, and commentary about the latest release. 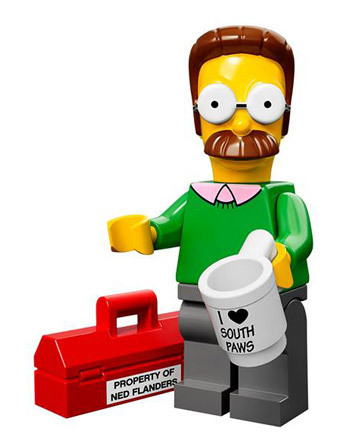 A full box of Minifigs will include rare, uncommon, and common figures. 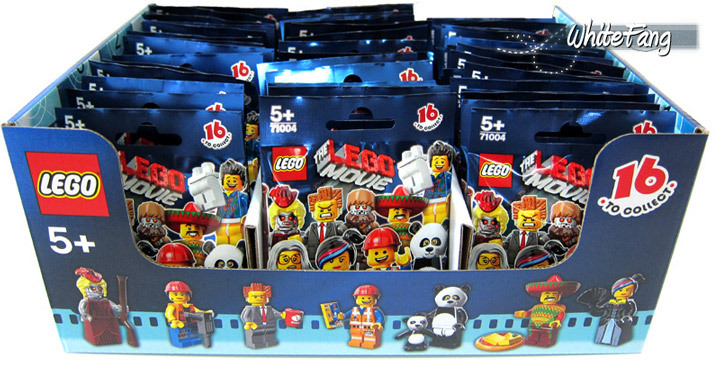 The common Minifigures include the Goblin, Carpenter, and Galaxy Trooper at 5 each per box. The uncommon ones include the Classic King, Sheriff, Snake Charmer, Alien Trooper, Egyptian Warrior, Evil Wizard at 4 per box. 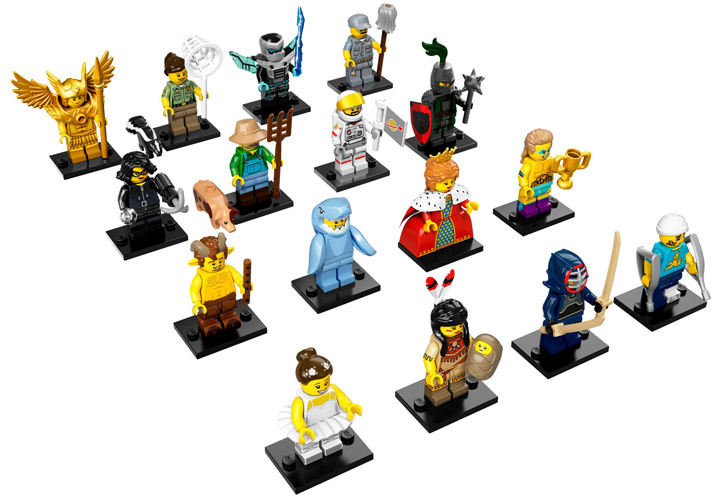 The hardest to find, rare, Minifigs will be the Unicorn Girl, Paleontologist, Fencer, Samurai, Disco Diva, Hot Dog Man, and Lady Cyclops at 3 per box. 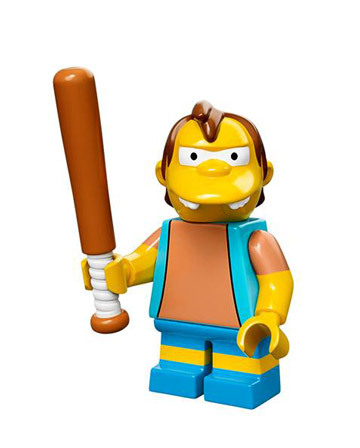 Hothbricks has revealed some new details on the upcoming Lego Minifigures Series 13 (71008). 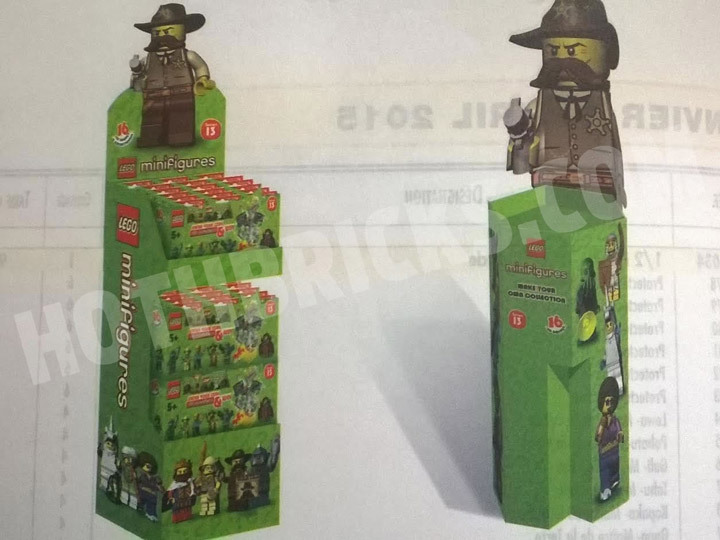 They revealed the first images of the packaging and boxes for Series 13. 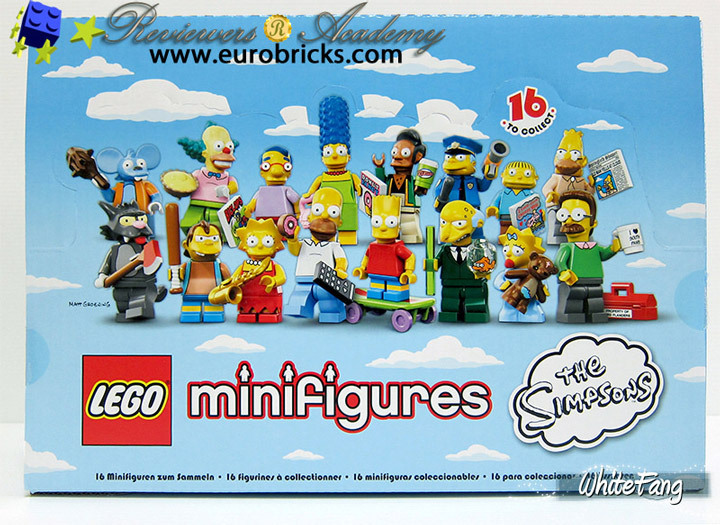 The artwork confirms 9 of the 16 new Minifigures. There will be an Alien Trooper, King, Snake Charmer, Female Cyclops, Paleontologist, Sheriff, Disco Diva, Unicorn Girl, and Egyptian Warrior. 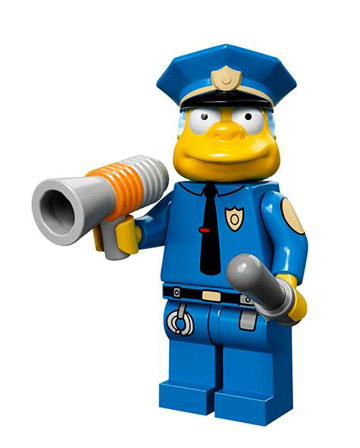 Other rumored Minifigs include a Galaxy Trooper, Evil Wizard, Goblin, Carpenter, Hot Dog Guy, Samurai, and Fencer. Stay tuned, as these leaks are usually followed by official announcements and artwork. 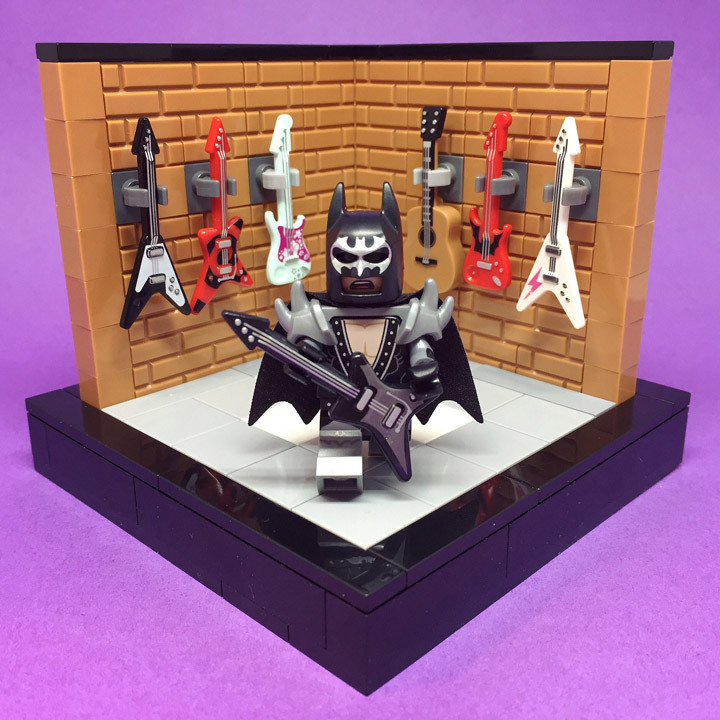 Lego is back with an all new release of their Collectible Minifigures theme. 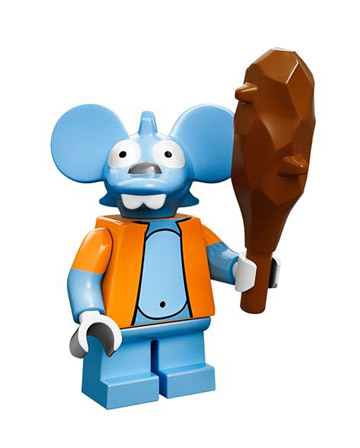 There are a total of sixteen unique Minifigs in the Lego Collectible Minifigures Series 12. 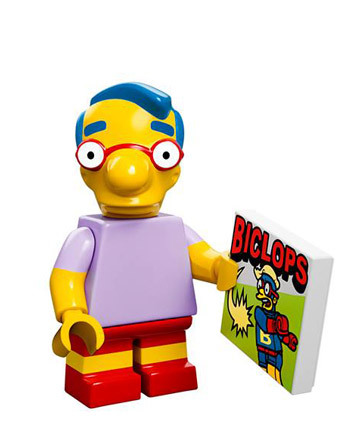 With a recent departure to do some spinoff (The Lego Movie, and The Simpsons) it is good to see Lego pick up where they left off. 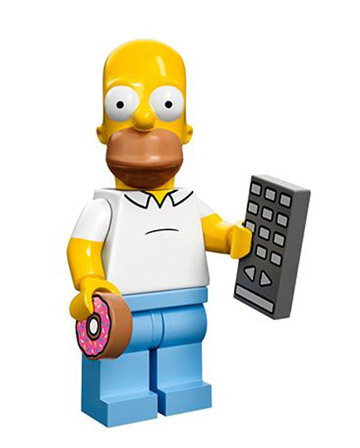 These new figures will be available in October, although if you are lucky you may find them in stores now. This new series is by far the most detailed, with a whole lot of fancy new sculpts and printing. 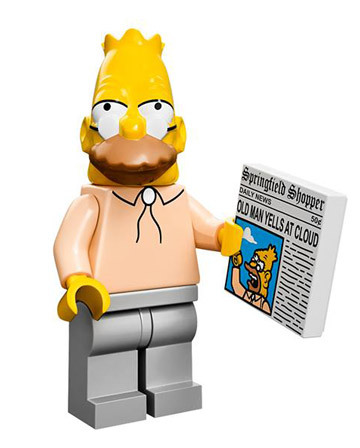 The only bad news is that Lego has carried over the higher price point that was first used in The Simpsons, $3.99. 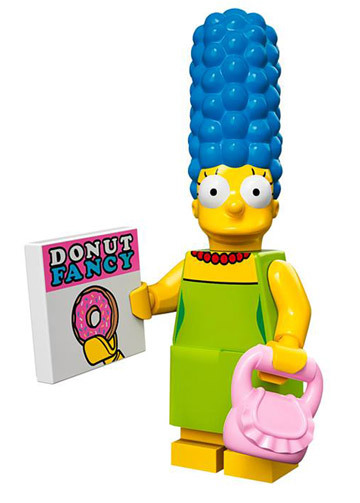 This feels like the maximum price Lego can sell these for. 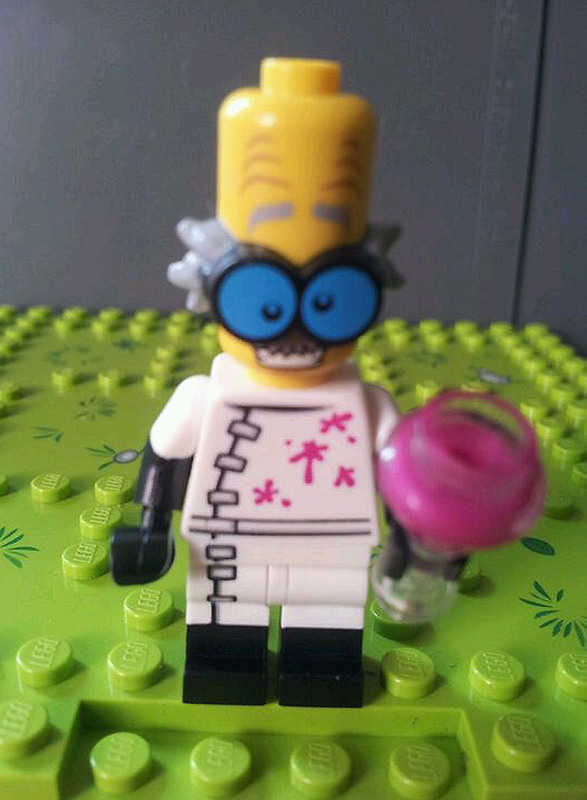 One new thing about this release is that every figure comes with a code to activate itself on Lego Minifigures Online. 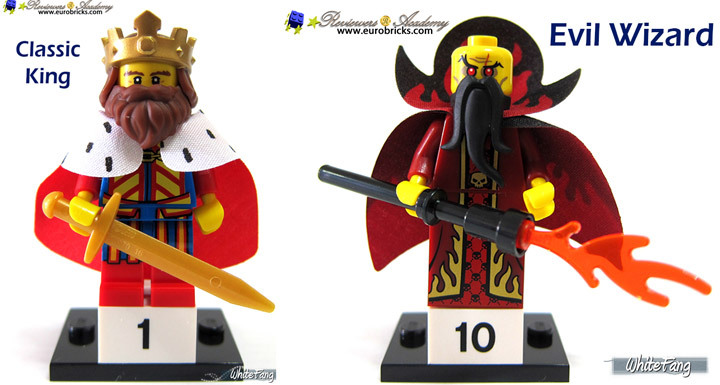 A super detailed review of each figure has been posted by WhiteFang over on Eurobricks. These reviews have earned their reputation for greatness. You cannot find a better review anywhere. 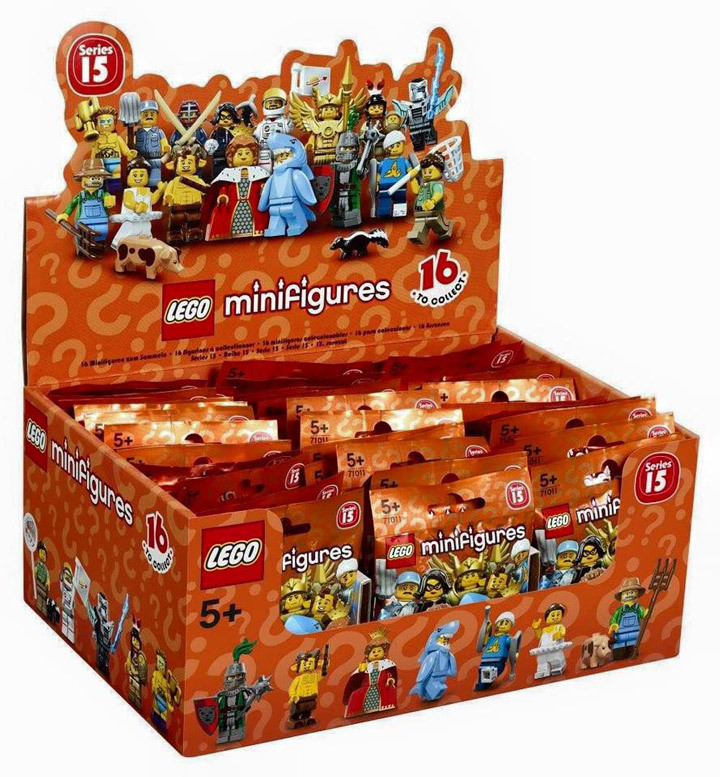 In each box of Series 12 you will find 3 complete sets of Minifigures. 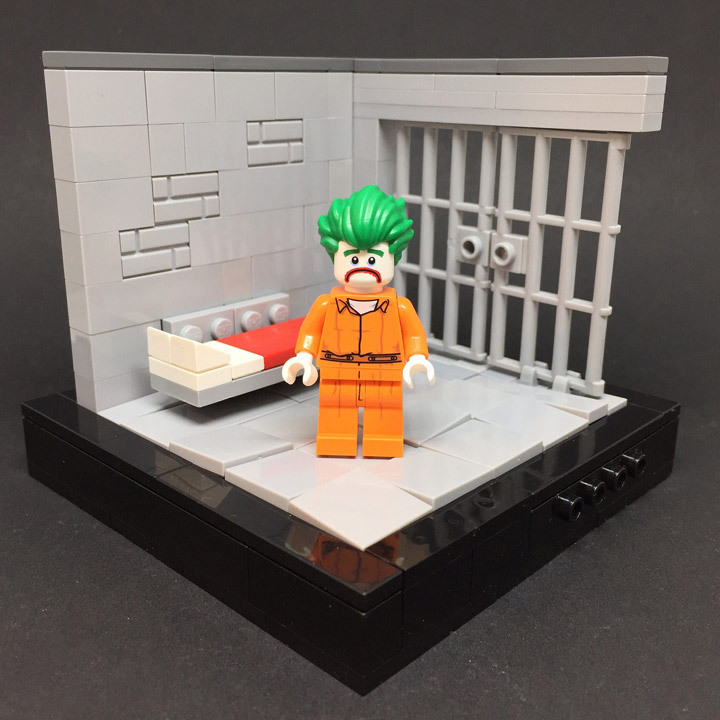 Lego seems to be doing a better job of choosing which ones are the most wanted. With the most common being: Video Game Guy (5), Space Miner (5), and Swashbuckler (5). 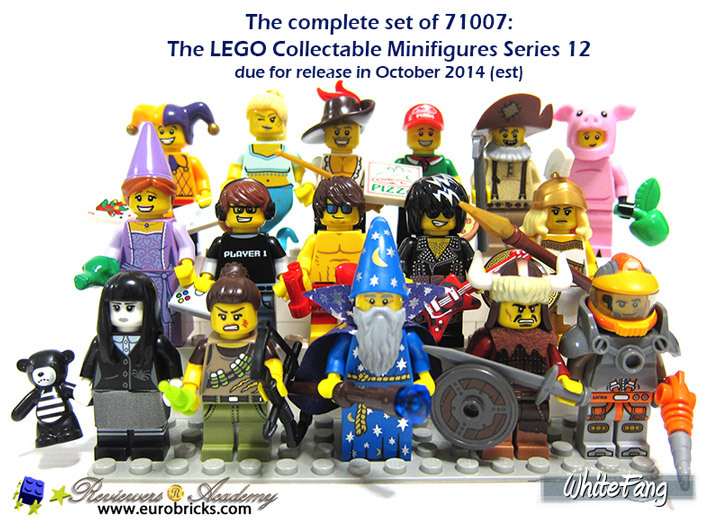 The uncommon Minifigs are: Wizard (4), Battle Goddess (4), Dino Tracker (4), Pizza Delivery Guy (4), Rock Star (4), and Piggy Guy (4). Finally, the rare figures are: Hun Warrior (3), Fairytale Princess (3), Lifeguard (3), Prospector (3), Jester (3), Genie Girl (3), and Spooky Girl (3). The biggest surprise here is that the Princess is a rare figure, with the recent popularity of the Disney Princess Lego theme it doesn’t make sense. The best thing about these figures is that everyone has a different favorite. 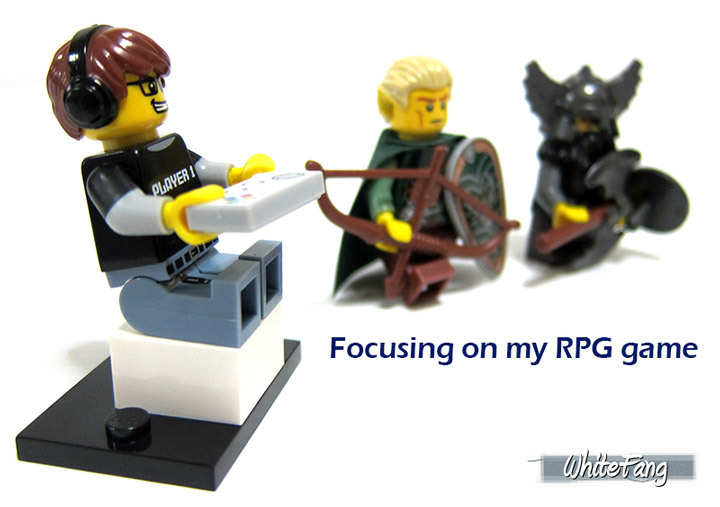 As for me, I will spend my time looking for a Gamer (and maybe a Wizard). 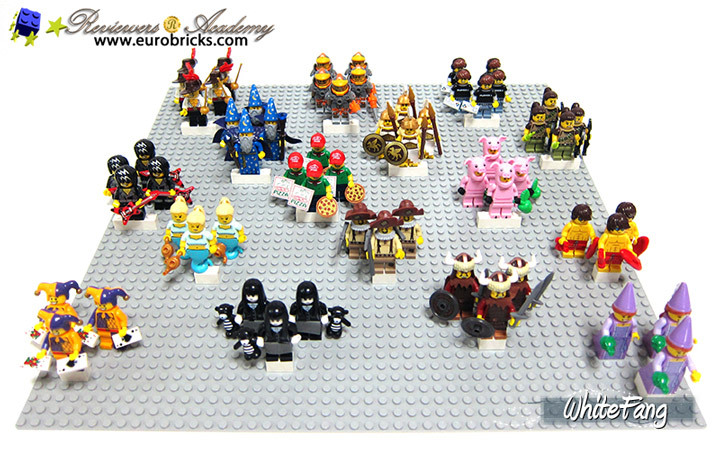 This is the first complete set photo for the upcoming Lego Collectible Minifigures Series 12. 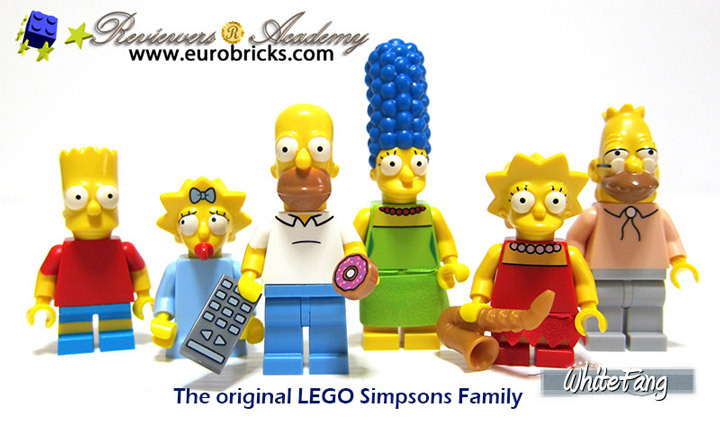 After taking a break from the standard format (The Lego Movie, The Simpsons) Lego is back with an incredibly strong line up. 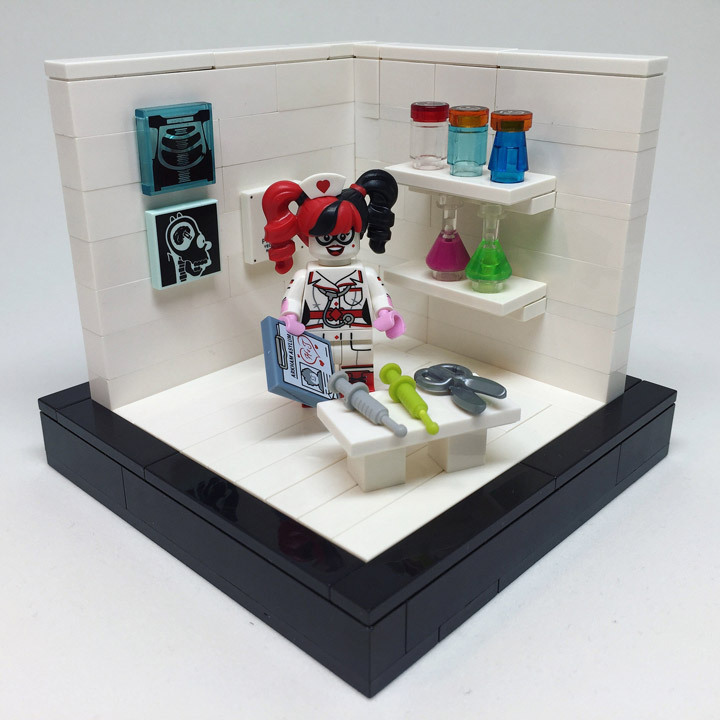 Lego has this down to a science at this point. 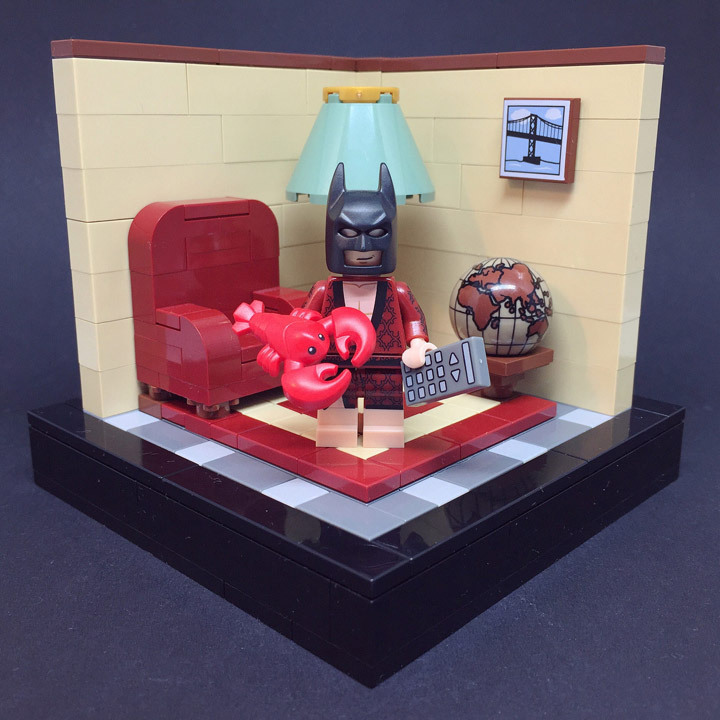 A few historical figures, a few modern characters, a few sci-fi minifigs, and one person in an animal suit. 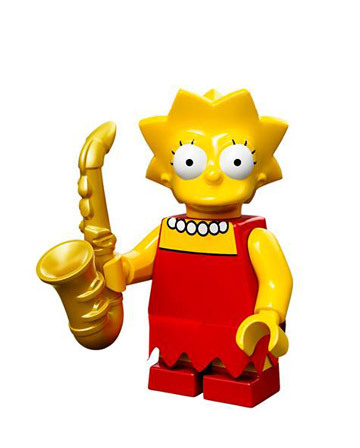 There are rumblings that the recent price increase with the Simpsons set will be made permanent. 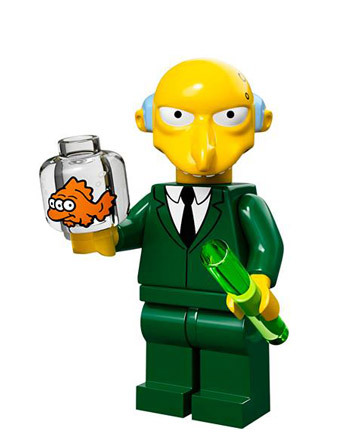 Meaning that the Lego Minifigures Series 12 will probably retail around $3.99 each. 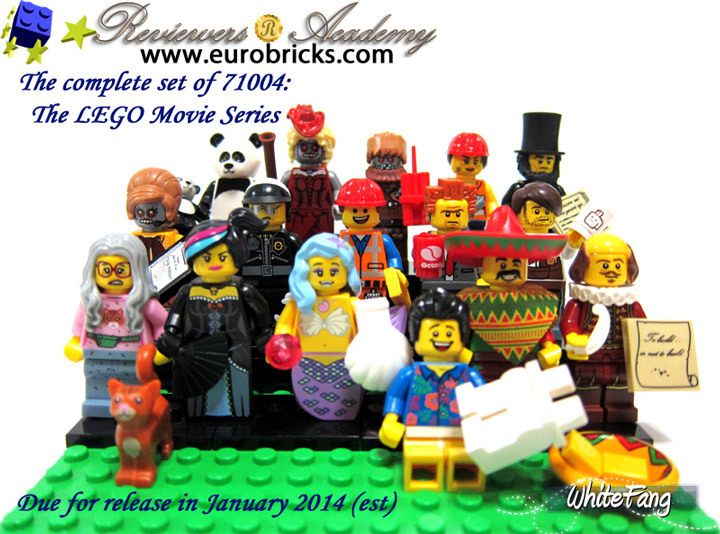 The new Lego Minifigures (71004) The Lego Movie Series is about to hit store shelves. 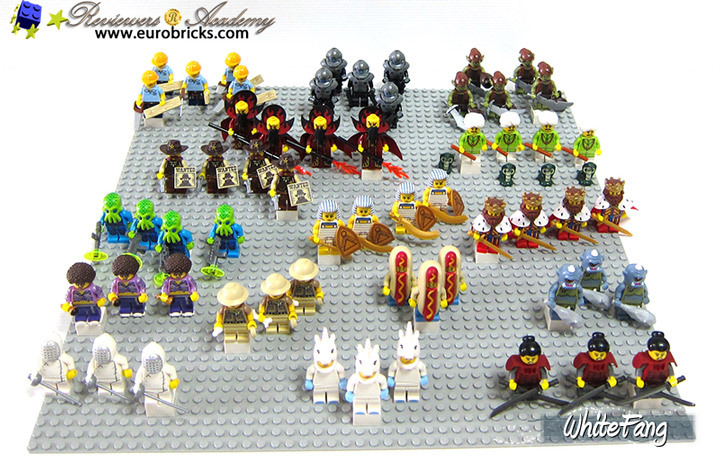 WhiteFang has done a full detailed photo review over on Eurobricks. 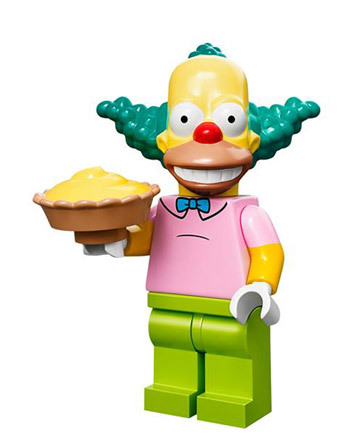 This new series is a slight departure from the normal Lego Collectible Minifigures. 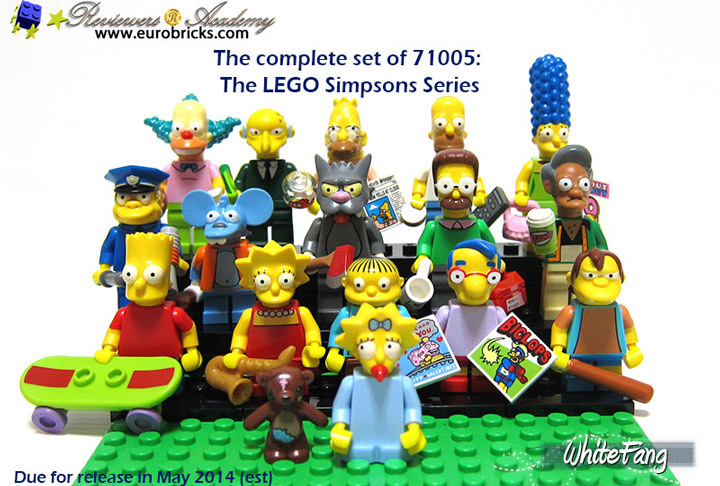 This is the first series to focus on one theme. 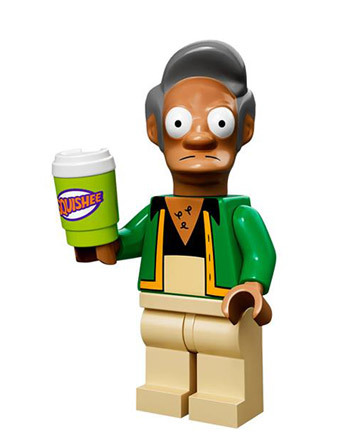 Here it is the upcoming Lego Movie. 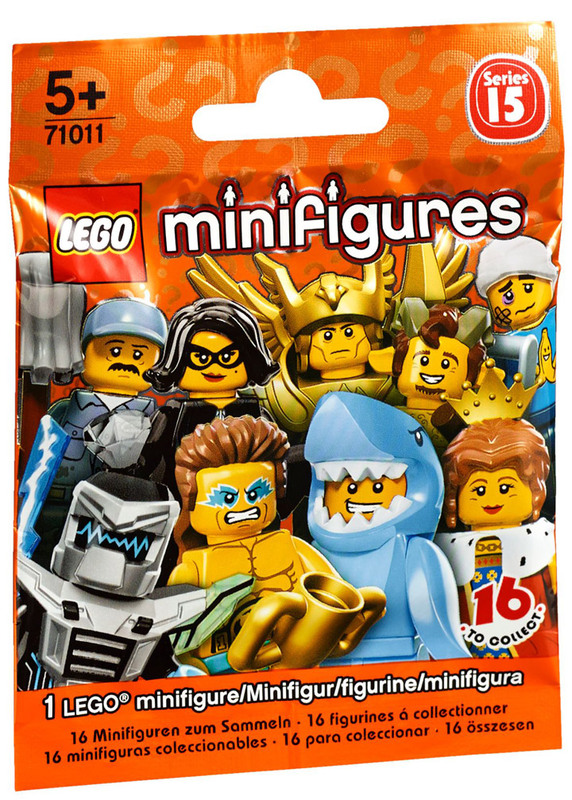 It has been assumed that this would be Series 12 of these Minifigs, but there is no mention of a series number anywhere on the packaging. 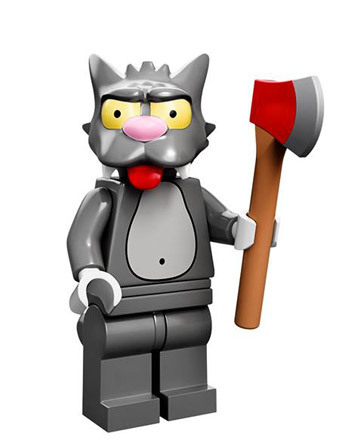 Instead Lego has made slight design changes to call it “The Lego Movie.” WhiteFang notes that we won’t be able to get a definitive answer on the nomenclature until the either Series 12 or Series 13 shows up. 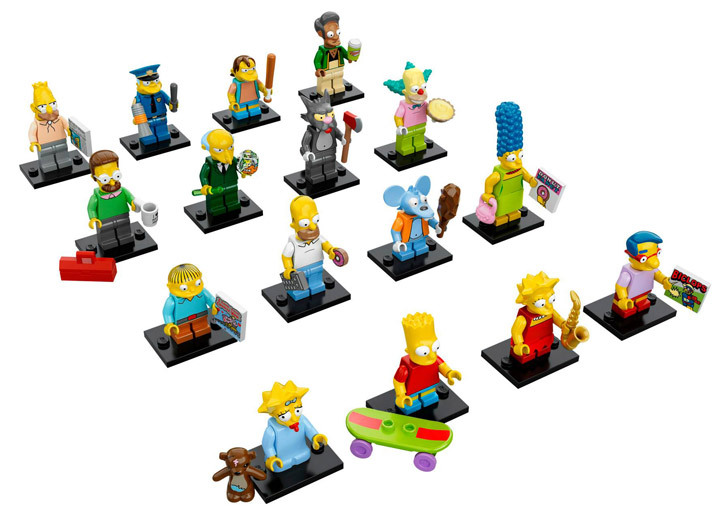 And, who knows where the upcoming Simpsons Minifigures will fit in. 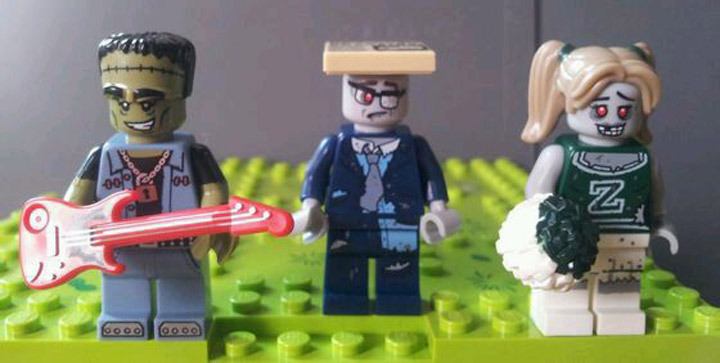 The Lego Movie Series contains a whole lot of personality. 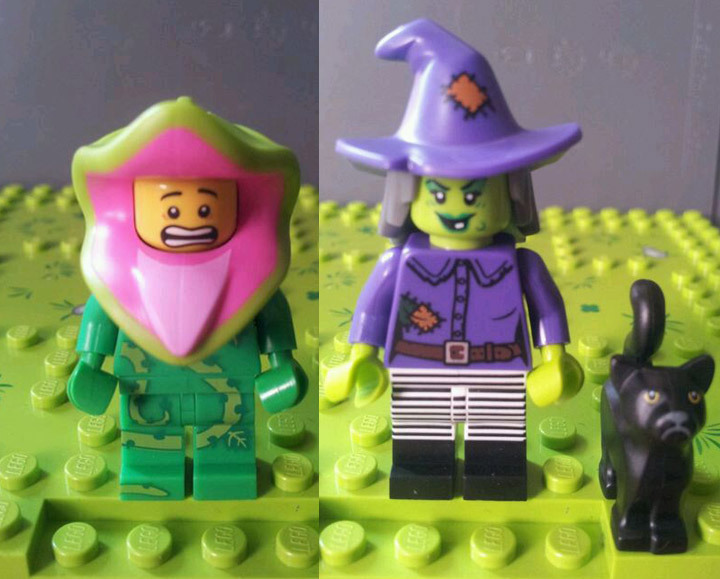 The Lego heads (faces) are all new, with a wide variety of happy and angry expressions. 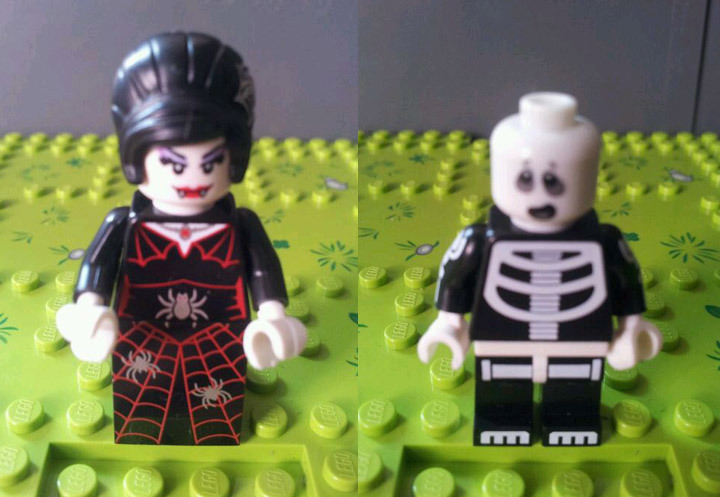 Combined with some of the new hair pieces means that this set will blend in well with other Lego minifigures. 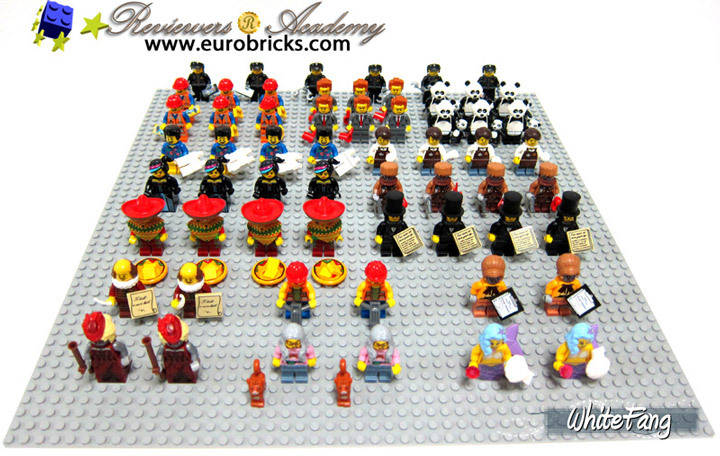 It looks like Emmet, President Business, Scribble-Face Bad Cop, and the Panda Guy are the common minifies this time around. With Calamity Drone, Mrs. Scratchen-Post, William Shakespeare, Gail the Construction Worker, Velma Staplebot, and Marsha the Queen of the Mermaids being the rare figures. 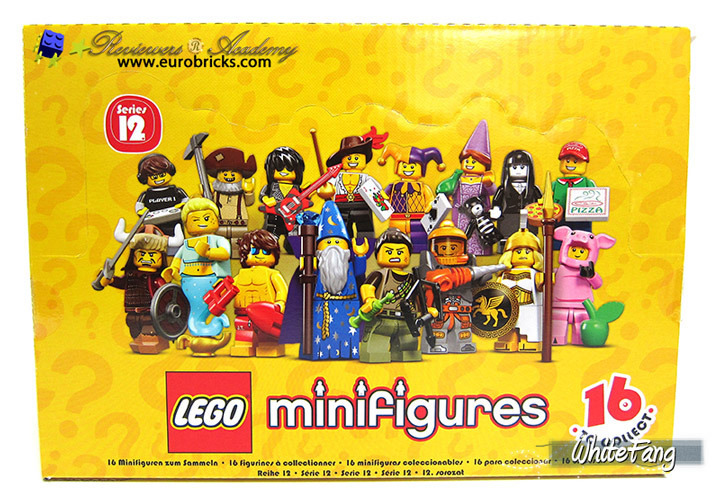 This series contains 16 minifigures: Calamity Drone, Gail the Construction Worker, Abraham Lincoln, Larry the Barista, Panda Guy, Velma Staplebot, William Shakespeare, Taco Tuesday Guy, “Where are my pants?” Guy, Wiley Fusebot, President Buisness, Wild West Wyldstyle, Hard Had Emmet, Scribbe-Face Bad Cop, Mrs. Scratchen-Post, and Marsha the Queen of the Mermaids.